Dec. 14, 2018 - The venerable Mystery Lovers Bookshop in Oakmont near Pittsburgh becomes the newest retail partner for Forged in Steel. April 13, 2018 - Forged in Steel's chapter 7, "Mental Toughness," is featured at the Beaver County Chamber of Commerce's Breakfast Club meeting, held at the Trinity School for Ministry in Ambridge, PA.
March 3, 2018 - Signed copies of Forged in Steel and Well At This Time are donated to the silent auction of the Beaver County (PA) Chamber of Commerce's 2018 Gala. Feb. 21, 2018 - For the 3rd straight year, a signed copy of Forged in Steel is donated to the Pittsburgh Post-Gazette Dapper Dan Dinner and Sports Auction. The book sells for 34% above the retail price. Feb. 6, 2018 - Forged in Steel and its powerful chapter 7 on "mental toughness" is presented at West Virginia University's College of Business and Economics, with thanks to Michael Walsh, Ph.D., for the invitation. Dec. 10, 2017 - In a testimonial quote, Keith Kuzio, president/CEO of Larson Design Group of Williamsport, PA, calls Forged in Steel "a unique leadership with strong lcoal sports fan interest which I enjoy sharing with others." Oct. 27, 2017 - A donated copy of Forged in Steel is a silent auction item at the annual Gala of the Mental Health Association in Beaver County, PA, honoring Dr. Neil Capretto of Gateway Rehabilitation Center and sponsored by Heritage Valley Health System. Oct. 14, 2017 - In a testimonial quote, Dr. Jim Dittmar, founder of 3Rivers Leadership Institute, says that Forged in Steel is "a meaningful, actionable leadership model, supported and illustrated by stories, that can make a real difference." May 3, 2017 - A working and professional men's group at Memorial Park Presbyterian Church in Allison Park, near Pittsburgh, completes a 19-week study based on a detailed, chapter-by-chapter review of Forged in Steel, led by Rev. Kevin Gourley. Feb. 23, 2017 - Publisher Mark Miner speaks about Forged in Steel at a Beaver County Chamber of Commerce new member reception in Beaver, PA.
Feb. 18, 2017 - Forged in Steel co-authors Tunch Ilkin and Damian Williams are interviewed on "The Rude Dog Show" airing on WBLZ Sports in Fullerton, CA and hosted by Rudy Reyes. Feb. 15, 2017 - Signed copies of Forged in Steel now available at the Hostess Gift Shoppe in Beaver, PA. Authored by Pittsburgh Steelers color commentator Tunch Ilkin and leadership authority Damian W. Williams, with Mark A. 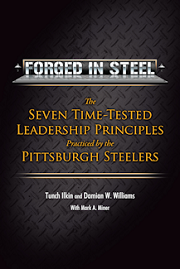 Miner, Forged in Steel is intended to help readers, as leaders in their organizations, communities and family, to tap into the enduring truths behind the well-honed values that make the Steelers great. Inspiring Standards – Identifying and living your values and mission establishes and sustains trust with those you lead. Contagious Humility – Humility becomes contagious in your team, resulting in greater interdependence and teamwork. Servant Leadership – You live to serve and add value to others, the only type of leadership that will bring out the best in others and consistently outperform other leadership styles. Strategic Team Making – Your team has a plan for success — and is crystal clear about it. Passionate Execution – Your team cares deeply about the game plan and will go the extra mile to execute it. Continuous Improvement – You are willing to pay the price for excellence, will improve every day and never settle for mediocrity. Mental Toughness – When things get hard, you have an integrity that chooses the right attitude in every situation and demonstrates the ability to bounce back.